Oops, sorry, that’s not me. It’s Andi Manzano! Apparently, she’s my celebrity doppelganger since I’ve been mistaken as her at times (particularly in the Philippine Star article on Reebok Jukari Fit to Flex). During the WaterPlus blogger event last month which I attended with other sports and food bloggers, we found ou just how much (or little) we resemble one another. 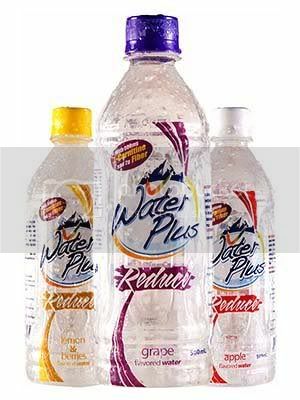 WaterPlus is a lightly flavored bottled water with no calories and no carbonation. One variant, WaterPlus Reduce, has fiber and L-carnitine to help with weight loss and fat burning. It’s available in three flavors: grape, apple, and lemon. My main interest in this product is how it helps me hydrate before a race or during a run. It always takes some mental effort to remind myself to drink more water in the days leading up to a race; drinking too much plain water at one time makes me feel bloated, and leaves a metallic taste in my mouth. Still, I try to drink at least 500ml of water right before going to sleep before a race. For Adidas KOTR I drank a whole 500ml bottle of WaterPlus (grape flavor), and it didn’t feel like a chore chugging down all that water. The flavor was just enough to make the experience pleasurable (much like how we can’t help ourselves with sweet softdrinks). I’ve also drunk WaterPlus during a long run (my 27-kilometer mosey last week through UP, White Plains, and Marcos Highway), purchasing it at a convenience store to replenish my hydration bottle, and I must say it does pretty much the same thing as water, except it makes everything go down easier because of the taste. After 12 kilometers of drinking nothing but water, apple flavor is a welcome change. I’m glad my doppelganger endorses a product worth using. See you in future races, Andi! Ah ok, her name is Andi pala. Seen her a few times on tv. Andi just looks better naman. Sorry bt being true. Bt u girls have just the same interest ganuon lang siguro. Actually, guys, this post’s allusion to me looking like Andi is more tongue-in-cheek than serious. I’ve definitely been mistaken as her time and again, but it’s because we were never seen in the same room together. We really don’t look a thing like each other. Don’t look like Andi in the picture but in person, yes!